Well after probably twenty blown stalks and a couple missed shots I finally connected this afternoon, Sept 10. Pretty boring story though. I worked a herd of goats all morning and watched this little guy get thumped royaly but the herd buck. After finally spooking the main bunch off I went to get some chores done. On the way to pump water for a bunch of cattle we brought in because of the fires in the area I spotted him again bedded across the river in some tall grass and below a little bank. Circled back around across our bridge and got above him. Crawled thru the tall grass and slipped a lucky arrow in from 25yards out. Took out his liver and he only went forty yards, my second shot spined him and that was pretty much it. Widow Longbow, Arrow Dynamics carbon and WW broadhead. One disturbing thing was that on the spine shot the Woodsman went practically thru the spine but the broadhead adaptor broke off at the back of the head. This is my first experience with screw-in points but I think this cowboy is gonna be changing to steel adaptors for sure. Congrats Doug! Glad to see you out hunting. 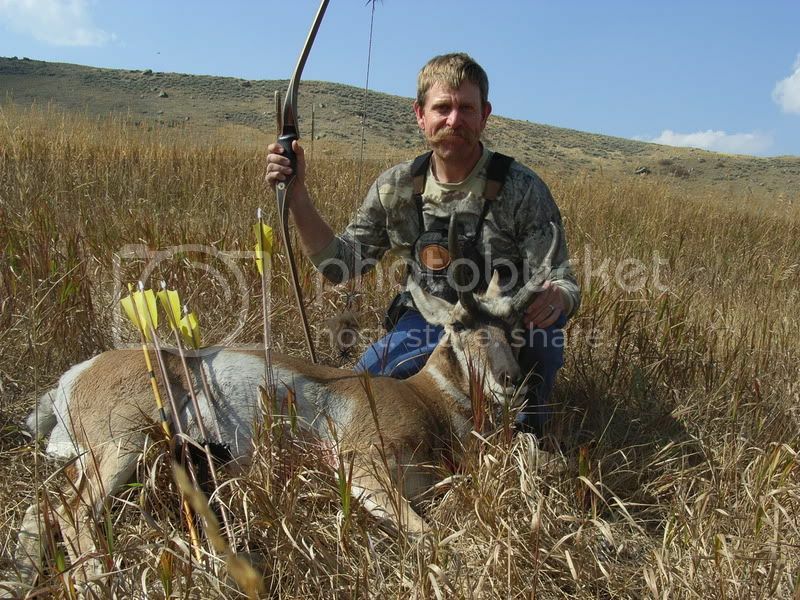 Great pic and thats something, getting the stalk on a 'lope, and pulling off the shot! I am w-a-a-ay envious! Congrats and great pic bud!! good for you, Doug! I like goat hunting. Congrats and I like the Pic. I really want to get one of those!